Ahoy Mateys upon the Internet Sea. This be me first entry int'a The Captain's BLOG. Hello Crew and visitors aboard this fine vessel. I am an illustrator and graphic designer setting out to create and map his place in our growing and inspiring creative world. This journey will hopefully be full of discovery and mystique, learning and entertainment. I am asking you to join me on it and share in its plunder. The title of this entry is not meant to be vague, it is quite literal. I was finally encouraged to create this extension of my freelance venture due to a vast sea of Paper Wings. I recently became a frequent visitor and fan to an amazing website and team. 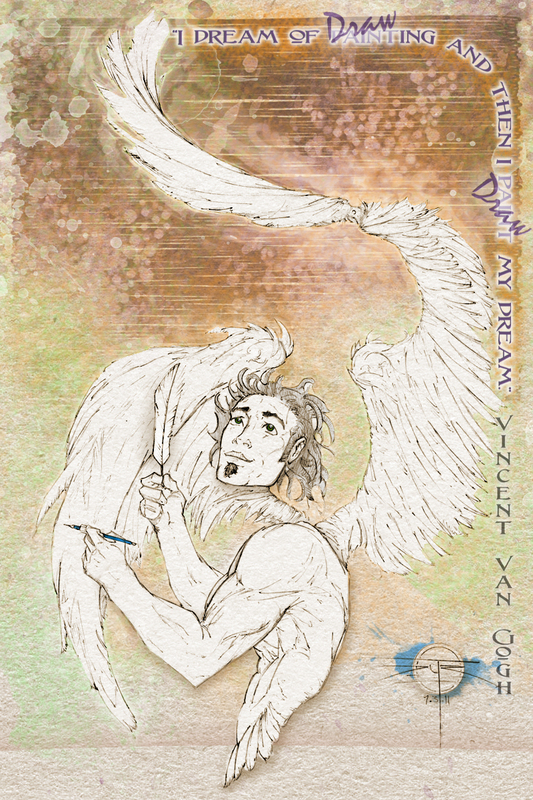 The site is called Paper Wings Podcast and it is designed to help visual story tellers realize and attain their dreams and create the time to do so as efficiently as possible. They have been coaching and inspiring me since I first found them and I am greatly appreciative of them, both the site's hosts & team and the many visitors. What does this have to do with my blog? Well, thats the interesting part. As of the writing of this first post, I am beginning my journey as their first contest's week worth of judging is ending. I created a piece for the contest and I am very thankful that I could participate. I love the piece. Well, what I realized is that the contest was wonderfully designed with 2 goals; awesome quality of art and excellent self-marketing. It was based on Facebook "like" button clicks on the site and before the start of the contest, I didn't even have a Facebook page. I wanted to win a contest judged by social media and I barley even existed in that realm. This twit had no Tweet. I know I have not won and it is not completely because of the quality of my art. It has emboldened me and made me stronger. The contest was meant to mirror the entertainment industry and to teach us the importance of both quality and marketing. This is one of the most important lessons any professional artist should learn. That is when I decided to stop stepping around the digital world, and dive right in. If I didn't create my identity, I risked giving someone else that privilege. I wanted to captain my own destiny and create as many proper opportunities as I could handle. That, me scallywags, is where you come in to play. You can visit and join my travels as I take on new tasks and ventures and watch and help me grow as a creative and professional. So..please hop on board whenever you pass by me port and I will try to keep the scenery interesting. It`s awesome to read this post on your new blog, congratulations on your start! It`s so inspiring to see the creativity and motivation that shines through your words, keep up the great work and I wish you lots of fun, inspiration and creativity!